Inspired by the underwater explorer Jacques Cousteau, Pete bought an old yacht on the south coast of England in 1982 and sailed to the South Pacific. He had no experience, relevant qualifications, life-raft, radio, GPS (or insurance) but he says, “I had read a lot of books and I had a plastic sextant I had bought at a jumble sale…” He also had a degree in marine zoology. For 20 years he sailed 45000 miles all over the South Pacific having the life of which he had dreamed, diving with whales and sometimes too many sharks. He found adventure above and below the sea aboard a beautiful, but somewhat marginal, wooden yacht! Escaping the rat race is the dream of many, but few achieve it. This book shows that with passion and determination anything is possible, even on a limited budget. Pete made ends meet by shooting pictures underwater – using home-made acrylic camera housings – and writing articles for diving and sailing magazines. The twelve chapters cover French Polynesia, the Cook Islands, Kiribati, Tonga and Pete’s favourite, remote Beveridge Reef, where there is no land at all. But it has what he loves most, exceptionally clear water and lots of sharks! Two appendices look at the Moody-built cutter Eila and underwater photography. 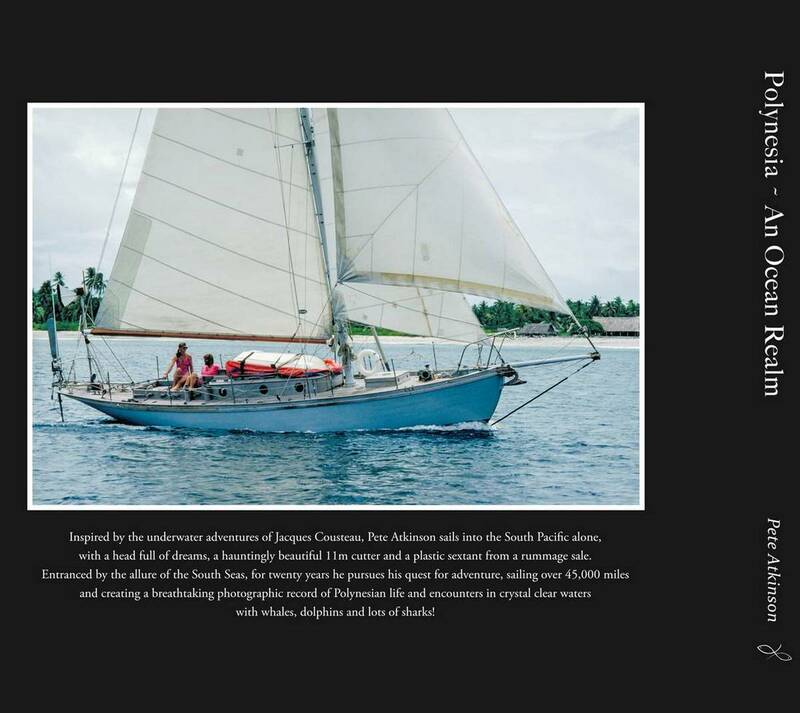 This is a book not only for those interested in adventure in the ocean, Polynesian life, marine biology, sailing and diving but also those who aspire to escape a humdrum life and become a pirate. Simon J. Hand, Phuket Gazette. If you are interested in purchasing a PDF copy of my book, please click on the following button. After payment you will immediately receive a direct link for the download. Award-winning Getty Images photographer Pete Atkinson studied marine zoology at Bangor University in North Wales where he learned to dive. His articles have appeared in Cruising World, Classic Boat, Tauchen, Diver, Sportdiver, Dive New Zealand etc and his photos have won many awards, including the Innovation Award at the the 2004 Wildlife Photographer of the Year and the award for “Best British Underwater Photographer” in 1999 and 2001. He now lives in Phuket, Thailand with his wife, photographer Darin Limsuansub. Contact Pete if you would prefer a signed hard copy, 13 x 11″, 223 pages, 339 pictures, 48000 words (2kg! ), for US $90 including SAL postage to North America, Europe, Australasia etc. You can read a long article in the press about Pete’s book HERE. 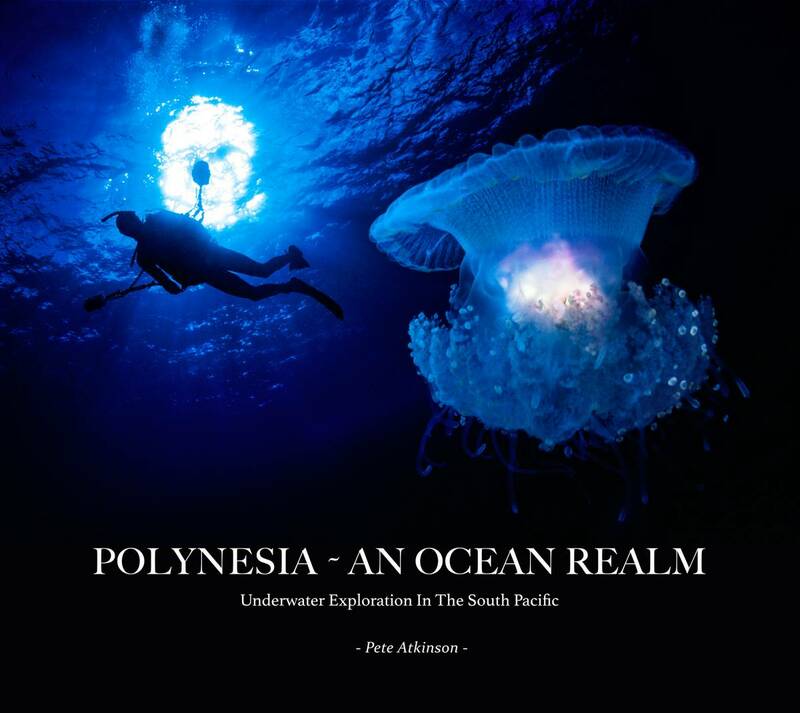 You can also download an extended Caption PDF file: Polynesia – An Ocean Realm CAPTIONS.